We’ve all heard the hype about low-pact this or that. Low-impact running. Low-impact aerobics. I really don’t know what the big deal is. I’ve been practicing low-impact exercise for years. 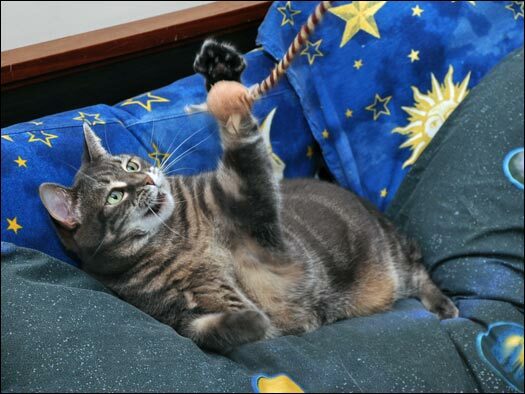 It’s really quite simple: if the cat toy comes within reach of where I happen to be napping, I’ll swat it. If not, I go back to napping. Low-impact! Now I’m not advocating this method for everyone, and there are times that I actually work up a sweat (well, sort of). And for those who think me a bit robust at 12 lbs., I’d love to quote a fan who recently came to my defense when she wrote, “Nora’s not fat. She’s fluffy.” How true. How true. I LOVE, LOVE, LOVE this litlle fluff ball Nora! My roommate Binga is nearly 12 lbs., and she is definitely NOT fat! She is all muscle. But then, she practices a lot of high impact exercise (and other-kitty-whapping! ), so that probably explains the muscle part. A greeting from Denmark. So you in a television broadcast parts here in Denmark. You’re the coolest cat I ever saw nora: o) I love you! I agree. Nora is not fat. She is FLUFFY! WOW! A piano playing cat, that’s crazy amazing! Have I said that Nora is cute? Well, I SHOULD!!!!!! Anyway, it would be great to have a piano playing cat at our house. But, we don’t have a piano! I guess we could have a guitar playing cat….. It just wouldn’t be as cute though. -Eli or Elias, or whatever you want to call me.